The rugged design of the Van der Graaf drum motor is space saving, quiet, efficient and reliable with virtually no maintenance. It offers a versatile, less complex and more efficient way to power your belt conveyor. Standard drum motors are available in mild steel or stainless steel construction, in a wide range of diameter sizes, belt speeds, horsepower and face widths to suit broad range of applications. 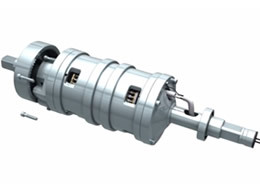 The electric motor is available in all voltages and frequency suitable for most applications. The drum motor houses all components internally, eliminating the need for external components like motor, gearbox, chain, chain guard and pillow block bearings. The drum motor rotates a gear module which transmits power to the outer rotating drum. Drum motor installation is quick and easy, requiring less time to install than exposed conveyor drives. Assembly of drum motor video.